Your art is the medium for your expression and a communication of your emotions and ideas. We believe art should be extended to merchandize to express your thoughts, emotions, beliefs and ideas. What better way than to marry art and fashion? Let curators of your artwork enjoy your collection on a variety of wearable merchandize! At launchmywear.com we make it possible to integrate art and fashion. We offer you a private e-store to showcase all your merchandise designed using your artwork, a 3D design tool to design on, the possibility for you to share your merchandise through social media, a made to order manufacturing facility without minimums or inventory, a payment gateway to let your consumers transact with you securely and a shipping to multiple Countries including USA, Canada and Australia. You can choose to showcase your art or the merchandize on your store depending on the interest and taste of your customers. It is no longer an art to look at and admire from a distance, but a wearable canvas that your customers can use, relate to and use as an expression of their own taste. To start with, register, log in to launchmywear.com and upload your artwork. Design a product out of many products available at launchmywear.com using your artwork. 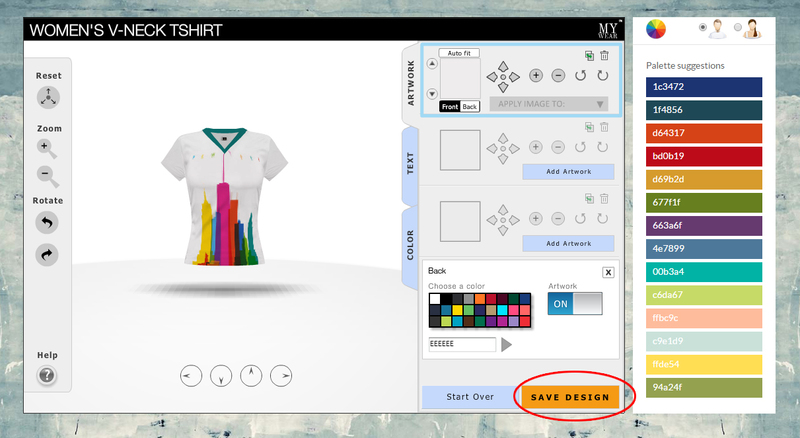 Click on the save button to save it in your merchandise gallery. Then tick on the image you would like to be the front image of your product and then update. This front image could be your artwork. P.S -You own exclusive rights to all images and artworks you have created. We don’t use your work for any purpose other than to fulfill your orders. Many a times emerging fashion designers may not have all the knowledge about various manufacturing processes nor may have access or experience dealing with multiple manufacturers. The limited availability of manufacturing setups that can do small quantities further restricts them from manufacturing their own apparels and accessories and to start their own clothing line. Getting patterns made, sampling, sourcing fabric and getting it manufactured with minimum order quantities is a long and tedious journey. Apart from that, designers may have to spend a lot of time in handling business operations such as collating orders, production booking, monitoring the production, payment processing, dispute resolution etc. At launchmywear.com we solve most of the problems associated with fashion designers starting a clothing line. We offer you, the designers, an on-demand manufacturing facility with an option to manufacture custom sizes and with a choice of fabric without any upfront cost or minimum order quantities. Pattern making: After you receive an order on your E-commerce store powered by launchmywear.com, our patent pending software creates the manufacturing ready patterns. Manufacturing: Based on the orders from your customers, we will custom make the products to their size and fabric choice. There are no minimums, no pre-orders and no inventory. All products are custom made on-demand. Drop Shipping: After the manufacturing is done, we ship directly to your consumers in multiple countries, including the United States, Australia and Canada. We continue to add more shipping destinations, so you can reach more customers worldwide. You can sign up at www.LaunchMyWear.com to launch your E-commerce portal, publish your products and start promoting on social media. We will take care of the rest. Have the passion for fashion and dream of running a fashion business? Many fashion designers really want to launch their fashion label and to run their own businesses, but there are lots of entry barriers to do so: How to get the best design tools, how to source the fabric, from where to secure money to run the business, how to set up logistics, how to create an online store, how to sell and many more. More importantly, how to get right people to help you to do the job! Take a deep breath; our new platform www.LaunchMyWear.com is here to help. This article will walk you through the process of starting your own clothing line – free!! Create a business plan: Create a business plan where you mention the mission and vision of your company along with business projections and mile stones. Identify current market gap, your closest competitors, and your total target market. Build your brand: Define your brand and jot down who are your typical customers and what kind of aspirational fulfillment they will have after they purchase your brand. For that, you brand name, logo, kind of categories you keep in your brand would be crucial. Your brand name should be unique and memorable. Your logo should be impactful which goes along with your value proposition. It should have right color combination as per the brand positioning. Your product categories should fulfill the requirement of your target segment with an impact. Infrastructure you need: If fashion design is your forte, to start with you would not like to invest much in software or tools and have any manpower to launch your clothing line to minimize the cost and risk. Of course, you wouldn’t have manufacturing or logistic support to start with. You may checkout http://www.launchmywear.com which offers 3D tool to design your products along with the possibility to auto grade the designs to multiple sizes at one go rather you creating it of your own and spending days on it. You can just focus on the designing and launchmywear.com takes care of pattern making and manufacturing as per your design, delivery of the products at customer’s destinations and the portal also auto credits your money in to your account with professional reporting. To manufacture launchmywear.com does not ask for any minimum order quantity or does not ask any registration fee or initial investment which is a norm now a days. Monitor seasonal trend: Fashion being very much trend focused where change is the only constant thing, you may need to change your styles frequently to keep it up to date as per the season and taste. Of course, be innovative to launch few unique cool designs. Marketing and selling: For this you would require your website which would catalog all your great collections. www.launchmywear.com offers you a free private portal of yours which would list all the items you design. You do not need to spend to secure domain name of your website. This portal also offers various design themes which you can keep as per the positioning of your store. You can arrange all the collections in your store the way you need. Keep refreshing to give it a new look. Promote your store on social media sites like Twitter, Facebook, Pinterest, Tumblr and Instagram which are great platforms to reach your audience free of cost. Launchmywear.com gives you flexibility to publish your collection on your social media sites directly from the portal and saves lots of time for you. Believe in yourself: Finally, believe in yourself that you can do it. The biggest fear to start any business is the risk associated with the investment you are making. With launchmywear.com you don’t have any risk as you don’t invest in anything. So relax, have fun and open your store at www.launchmywear.com to give it a try.